The Drought Impacts on Regional Ecosystems Network (DIREnet) fosters and facilitates research on drought effects and the potential role of global climate change on the Southwest’s major ecosystems. Much of what DIREnet does is bring scientists and land managers together to plan and conduct research, but here you will find a portal to data, published research, news, and much more. The Southwest is projected to become warmer and more arid in response to climate change during the 21st century. More severe and longer droughts may also be part of the region’s future. How these changes will affect the Southwest’s forests and woodlands is of increasing concern. Millions of trees throughout the Southwest were killed by bark beetle outbreaks, fires, and other factors linked to drought and warming during the first decade of the century alone. 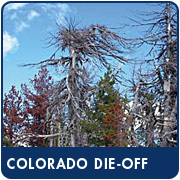 Southwestern Colorado has experienced the widespread die-off of aspen trees. 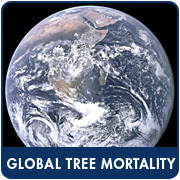 A new study examines the feasibility of estimating this loss of aboveground biomass and suggests new possibilities for monitoring the impacts of large-scale tree mortality events on carbon cycles. 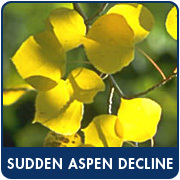 New study published in the Early Edition of the Proceedings of the National Academy of Science examines the mechanisms underlying recent widespread and climate-induced aspen forest mortality in western North America. New research traces the recent West-wide decline and death of aspen trees to stress caused by recent drought, which weakened the trees' ability to move water through their vascular systems. 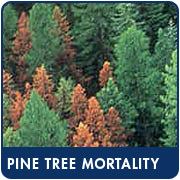 Professor Jeff Mitton and researchers from the University of Colorado explain the connection between the unprecedented mountain pine beetle epidemic and climate change in Colorado. This material is based upon work supported by the National Science Foundation under Grant No. 0443526. Any opinions, findings, and conclusions or recommendations expressed in this material are those of the author(s) and do not necessarily reflect the views of the National Science Foundation.